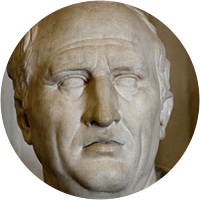 A collection of the best Cicero quotations. Thrift is a great revenue. The law is silent during war. What is dignity without honesty? Freedom is participation in power. The sinews of war, unlimited money. Laws are silent in the midst of arms. They damn what they do not understand. The beginning of all things are small. You should eat to live; not live to eat. The good of the people is the chief law. The mind of each man is the man himself. Victory is by nature haughty and insolent. Dare to give true advice with all frankness. There is no place more delightful than home. I criticize by creation—not by finding fault. No man can give you wiser advice than yourself. A room without books is as a body without a soul. Man is never less at leisure than when at leisure. Where is there dignity unless there is also honesty? Speakers are most vehement when their cause is weak. Grief is not in the nature of things, but an opinion. When fortune is fickle, the faithful friend is found. The existence of virtue depends entirely upon its use. Many wish not so much to be virtuous, as to seem to be. There is no fortress so strong that money cannot take it. Courage is that virtue which champions the cause of right. The thirst of desire is never filled, nor fully satisfied. Philosophy, rightly defined, is simply the love of wisdom. No man is so old as to think he cannot live one more year. One day well spent is to be preferred to an eternity of error. What is fitting is honorable, and what is honorable is fitting. Men are like wines, age souring the bad, and bettering the good. No man should act as to make a gain off the ignorance of others. A man only employs his passion who can make no use of his reason. The most fruitful of all the arts [is] the science of living well. Philosophy, if rightly defined, is nothing but the love of wisdom. There is something pleasurable in calm remembrance of a past sorrow. The greatest incitement to crime is the hope of escaping punishment. Would that I could discover truth as easily as I can uncover falsehood. Where pleasure prevails, all the greatest virtues will lose their power. The more peculiarly his own a man's character is, the better it fits him. He does not seem to me to be a free man who does not sometimes do nothing. Man does not seem to me to be a free man who does not sometimes do nothing. In prosperity, let us take great care to avoid pride, scorn, and arrogance. Let us not go over the old ground, let us rather prepare for what is to come. It is hard for the good to suspect evil, as it is for the bad to suspect good. Action is the language of the body and should harmonize with the spirit within. The more virtuous any man is, the less easily does he suspect others to be vicious. Time destroys the speculations of man and omen, but it confirms the judgment of nature. Of all nature's gifts to the human race, what is sweeter to a parent than his children? It is a truth but too well known, that rashness attends youth, as prudence does old age. We are all excited by the love of praise, and it is the noblest spirits that feel it most. It is not only arrogant, but profligate, for a man to disregard the world's opinion of himself. I follow nature as the surest guide, and resign myself, with implicit obedience, to her sacred ordinances. For how many things, which for our own sake we should never do, do we perform for the sake of our friends. When you wish to construct be brief. Every word that is unnecessary only pours over the side of a brimming mind. The wise are instructed by reason; ordinary minds, by experience; the stupid, by necessity; and brutes by instinct. History is . . . the witness of times, the torch of truth, the life of memory, the teacher of life, the messenger of antiquity. When you wish to instruct, be brief; that men's minds take in quickly what you say, learn its lesson, and retain it faithfully. Intelligence, and reflection, and judgment, reside in old men, and if there had been none of them, no states could exist at all. Wise men are instructed by reason; men of less understanding, by experience; the most ignorant, by necessity; and beasts by nature. I can think of nothing more agreeable to the brain and the ear than a speech adorned and embellished with wise thoughts and fine language. The precept, 'Know yourself,' was not solely intended to obviate the pride of mankind; but likewise that we might understand our own worth. Avarice in old age is foolish; for what can be more absurd than to increase our provisions for the road the nearer we approach to our journey's end? A careful physician, before he attempts to administer a remedy to his patient, must investigate not only the malady of the man he wishes to cure, but also his habits when in health, and his physical constitution. Diligence, as it avails in all things, is also of the utmost moment in pleading causes. Diligence is to be particularly cultivated by us; it is to be constantly exerted, it is capable of effecting almost everything. Never can custom conquer nature, for she is ever unconquered. This law then, was not written, but born. It is a law which we have not learned, received from others or read, but which we have derived, absorbed and copied from nature itself.